Sassy actress, Oby Edozieh has concluded to take her movie, Save Our Souls to London, one of the cities in which the movie was shot. Shot in India and London, ‘Save our Souls’ is to be premiered in London on the 11th of December, 2010 at Waltham Forest town hall, forest road, Walthamstow London. Red carpet is expected to commence by 6pm while the premiere proper will start by 8pm. The film ‘Save our Souls’ is about the emotional and psychological trauma that comes along with cancer and its effect on victims and their families, as well as various ways people choose to deal with it. The movie is directed by Moses Iyang, Its cast include the likes of Kenneth Okonkwo, Elebelu Elebuwa, Chioma Chukwuka, Ebere Okaro, Segun Arinze, Oby Edozie herself and many others. 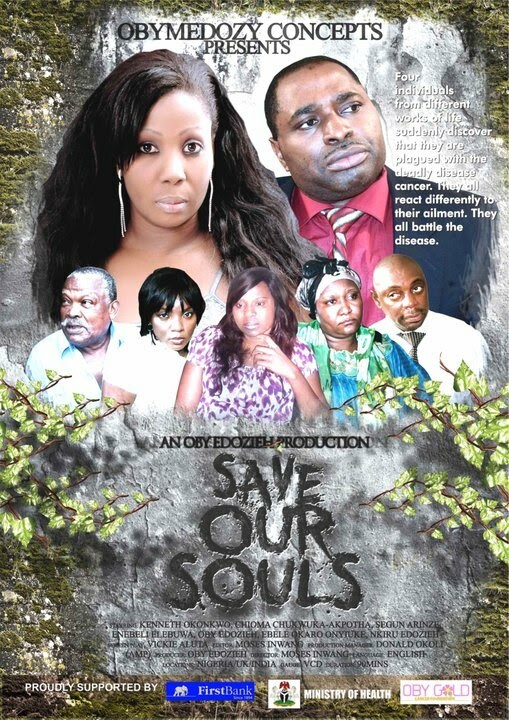 ‘Save our Souls’ is not only an entertaining movie but a very educative one and has won the support of big shots, organisations that are deeply concerned about the pain of people with cancer and will at anytime support cancer management or if possible eradication, firms like First Bank, the Federal Ministry of Health and Oby Gold Foundation. Speaking on the movie, Edozieh said ‘the movie has been very involving in terms of budget and other logistics, especially since the cast and the movie had to be moved to the two countries, but with the quality of movie we came up with, all the effort was worth it’.